I recently downloaded Yosemite, and I'm trying to update my Xcode. I hit 'Update' in the App Store, and but it's been stuck at 'Waiting' for the past 30 minutes. Just wait it out. If you attempted a fix listed in another answer here, quit all applications, restart your computer, and when you boot back up, open the app store to the update page, click the update button and forget about it. It took mine about 20 minutes to actually start and move out of "waiting". I read reports that for some people it took about an hour for it to start. I tried everything else before and was ready to do a full reinstall of xcode. Nothing worked but for me to just wait. 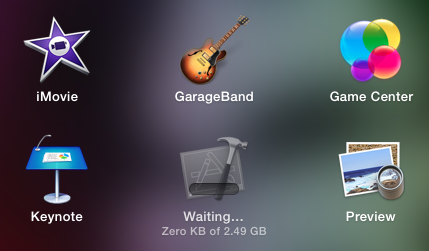 I solved the problem by moving Xcode from my Applications folder to the trash bin. I didn't have an option to cancel the update (all the buttons under Update in the App Store were grayed out for me). Once I typed in my password to confirm the move, the App Store prompted me to either cancel the update, or delete the app. Opting to delete the app caused the update to start downloading immediately. I did not cancel anything, open AppStore and initiate the update (if you haven't done it yet); then click on the "Store" in the top-left menu and choose the following option - "Check for Unfinished Downloads...". Enter your Apple ID and password and you everything will be up and running. The reason is that XCode does require additional confirmation before download. Yesterday this happened to me during regular check for updates, and between multiple restarts, and removing manifest.plist things started working again. ( I actually did some renaming to discover that this was the file of interest. Just to add another answer here, I had two versions of Xcode in the launchpad. Opening one brought up a dialogue box asking if I would like to "Install additional components", which seems to have fixed it. This worked perfectly for another App Store download stuck in "waiting". I quit the App Store, opened Terminal, pasted in code from Sheharyar's post above to clear cache, and pressed Enter. Restarted App Store and was able to begin my download immediately. Not the answer you're looking for? Browse other questions tagged macbook mac-appstore xcode yosemite launchpad . How can I get Xcode to install under Lion?